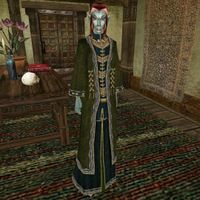 Medila Indaren is a Dunmer mage who sells spells at the Caldera Guild of Mages to any who need them (except vampires). She offers medium training in Destruction, and minor training in Alteration and Mysticism. This spell itself is pretty much useless, since it is not possible for anyone but you to ever contract a disease. However, if you want to get the effect to make a spell or enchantment to weaken yourself to disease (say, in order to become a vampire), this is the only way to do it, as nobody else has a spell with this effect for sale.